I recently had a conversation with a group of nurses and their comms department – The nurses were really fired up about social media and wanted to tweet and share and explore, however the comms department were slightly more risk orientated and wanted to control everything. The solution the comms department came up with was for them to run a generic nursing Twitter account and the nurses email them their tweets whilst the nurses wanted to create their own Twitter accounts, for their departments, independently tweeting from them. What stuck me about the situation was the whole lack of strategy towards social media from both parties and it made me think about the approach that I take towards social media. I have always taken a very process driven approach to most things and social media is no exception; using a model that I am familiar with and works in my professional nursing life – The Nursing Process. The Nursing Process is a tried and tested logical approach to problem solving in nursing and as per my previous blog “The Wheel” sometimes in a social space we need to recycle, share and apply old concepts in new spaces. In the same way that “The Nursing Process is a systematic approach to planning and delivering nursing care” (Holland et al 2008) it can provide a systematic framework for the existence of organisations within a social space. It is a process that has been around since, what seems like, the dawn of time – according to Wikipedia since 1948 with Ida Jean Orlando (pictured above) being the first person to describe nursing practice in this way. 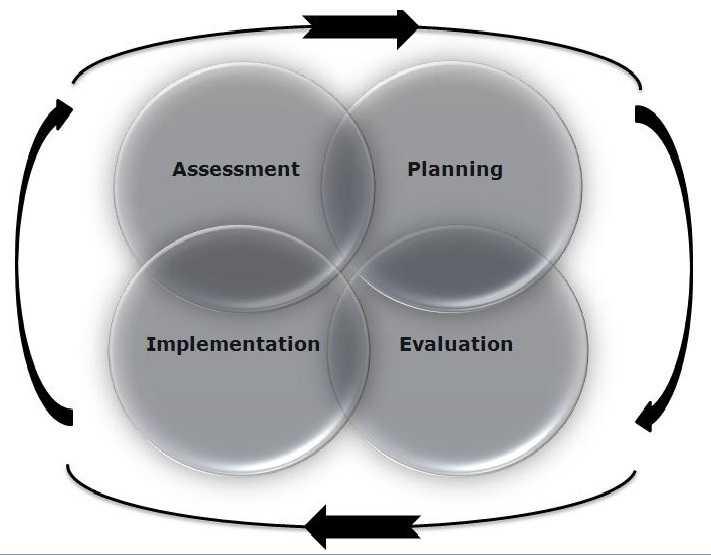 Holland et al (2008) describe 4 main steps to the nursing process – Assessment, Planning, Implementation and Evaluation and as in nursing when existing in a social space these steps are not only cyclical but are also closely related and touching one another … allowing for a continuous and seem less but effective process. The logic that the nursing process gives when applied to a social space allows for us to take a metaphorical step backwards instead of steaming headlong into things because it’s “what everyone else is doing” or is currently “en vogue” It allows us to explore all angles and apply what we know works and explore further where we need to. One of the key reasons why healthcare organisations are struggle in this space is because we are failing to identify the complexity of engaging using social media – tweeting as an organisation is much more than merely writing 140 characters and hitting the tweet button! In order to have meaningful, valuable and worthwhile engagement with the right people at the right time and in the right place it takes so much more. In my next blogs series I will be exploring each of the stages of the nursing process and applying them to social media, sharing my thoughts and approach to those interested in using social media to spread value and achieve social media success …. if it transpires that social media is the right way to go !